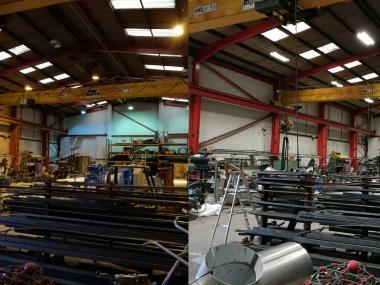 The firm’s director, David Pilgrim, wanted to tackle poor lighting levels in the production area and reduce energy costs by upgrading to LED lighting. However, the company was unsure of where to start to get a full appraisal of their options. To find the right solution, David worked with Alasdair Dalzel-Job, an environmental business advisor at the Greater Manchester Business Growth Hub, to establish key drivers and find suitable local suppliers. Alasdair gathered the required technical data and put a call for information out to members of the Hub’s Low Carbon Network – a free-to-use online directory of over 200 companies in Greater Manchester that provide low carbon and environmental goods and services. As a result, Massey and Harris received a shortlist of potential suppliers that had gained Carbon Trust-accreditation, meaning that they could quality for a grant towards the capital cost of new lighting. Following a full assessment with the Hub’s support, Massey and Harris selected CorEnergy, an energy efficient lighting provider less than five miles away which specialises in design, supply, installation, long-term aftercare support and zero-capital finance. The new lighting has now been fitted and has resulted in a 63 per cent energy reduction on lighting, saving over £1,400 in annual energy costs. Staff have also reported noticeably less glare when working with stainless steel, helping to improve quality of work. The colour temperature of the light has also benefited the final polishing process; the previous yellow light hid much of the weld burns, whereas the whiter LED light shows all of the colour variations to ensure they are removed. “It looked like a time-consuming and complex process to source new lighting, so the Business Growth Hub’s expertise was hugely beneficial for us”, said David Pilgrim.